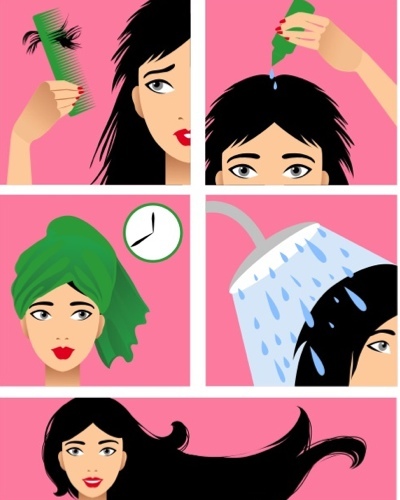 #RealGirlBeauty: 7 Simple Ways to Stop Hair Fall! Are you leaving a hair-trail everywhere you go? Are your precious strands clogging the shower drain? You are not alone. An imbalanced diet, hectic schedules and improper hair care can cause immense hair breakage. Here are some simple ways to stop hair loss and help you get back into the mane game! When done with your shampoo, avoid rubbing your hair vigorously with a damp towel. Excess friction can cause your strands to weaken and break. This is the best way to control hair loss. Plus, most towels are a blend and not 100% cotton, therefore not gentle on your mane. Your safest bet is to put your head upside down and pat your locks (lightly) from root to tip. It may sound surprising, but research suggests that the zinc pyrithione (ZPTO) may promote hair growth. Keep a close watch on your scalp and use an anti-dandruff shampoo containing ZPTO or ketoconazole at least once a week. We like the Head & Shoulders Cool Menthol Anti-Dandruff Shampoo to stop hair loss. Avoid combing your hair when it's dripping wet; it’ll only add to your woes. Instead, air-dry your hair naturally for as long as possible. Start de-tangling the ends and move upwards towards your scalp instead of dragging a comb from the roots to tips. If you must use a hairdryer, use lower heat settings. You have to be gentle on your hair to control hair loss. A relaxing scalp massage is not only a perfect way to unwind after a long day but it also helps boosts blood circulation and strengthens weakened hair. It helps greatly to stop hair loss. Treat yourself to a round of nourishment with an indulgent massage using an oil such as Parachute Advansed Coconut Hair Oil or MoroccanOil Treatment (the latter has argan oil, proven to improve hair quality). You’ve probably heard your mom and grandmom repeatedly advise you to avoid chemicals and go au naturel. If you’ve ever coloured your hair, you would know that this is sound advice as you would have seen for yourself that chemicals really do weaken your hair and cause much more hair fall than before. Try this fix: Soak fenugreek (methi) seeds overnight and then grind them to make a paste. Massage it on your scalp and hair, and keep for 15-20 minutes. Wash it off with a mild shampoo. You will soon trust it as a great way to control hair loss. Apart from a making sure you have a high-protein diet, get your share of fatty acids and antioxidants by eating a handful of nuts including walnuts and almonds to help boost hair growth. Add flaxseed to your lemon water, and munch on avocado from time to time.